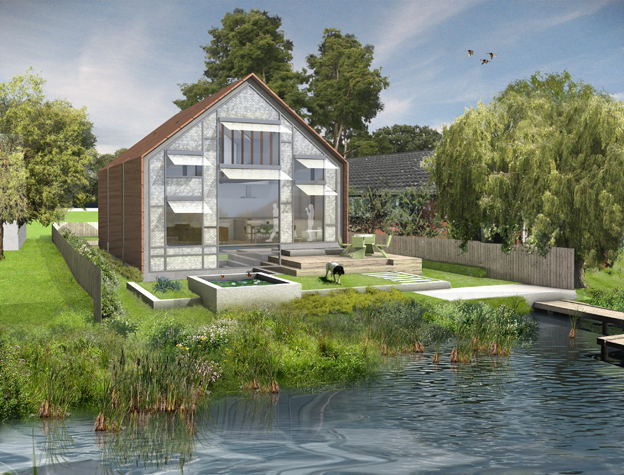 We are pleased to announce that we have secured full planning permission for the UK’s first amphibious house that will be built on the banks of the River Thames later this year. An amphibious house is a building that rests on the ground on fixed foundations but, whenever a flood occurs, the entire building rises up in its dock and floats there, buoyed by the floodwater. The Local Authority and Environment Agency supported this proposal because it was a replacement dwelling so flood risk was reduced on this site. The consultancy group was headed by GHK Consulting; Baca Architects, London; and the University of Wolverhampton’s School of Technology. Additionally the Books’s design concept was also developed by Baca Architects.